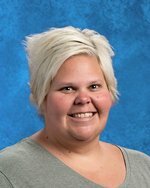 Mrs.Trent has received an Associate of Science Degree in Special Education, as well as a Bachelor's Degree in Education. Mrs. Trent taught for 1 year at Ritta Elementary in Knoxville, Tennessee. Mrs.Trent has spent 6 years at Cherokee High School, 1 of which was as an assistant. Mrs. Trent has taught Behavior Modification, Extended Resource, and Math Intervention.